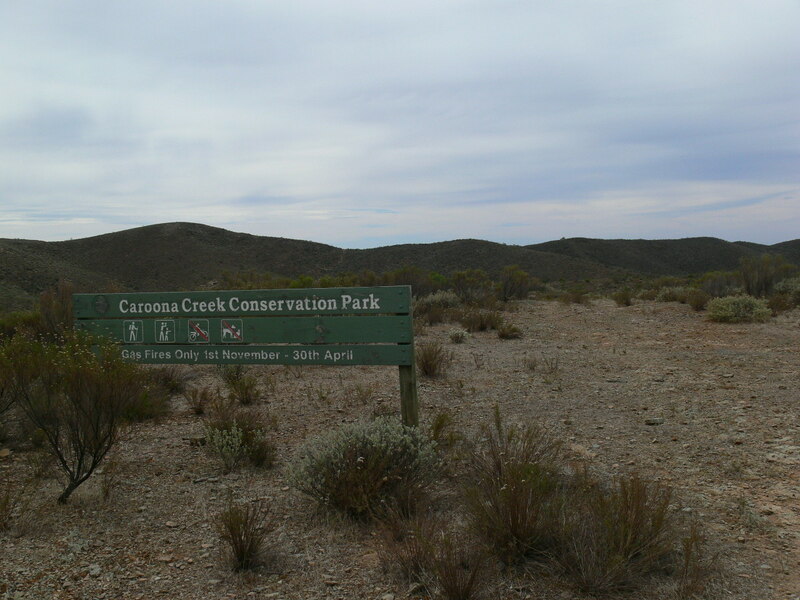 As a prelude to a 4WD day out on Saturday, I thought I would activate Hopkins Creek CP on the way to Burra, as it had never before been activated for the WWFF Award. We drove up through Truro, Eudunda and Robertstown before hitting the dirt a few kms north of Robertstown. I had attempted an activation last year but a car rally in the area meant some detours and nearly an hour of driving around trying to find the right spot and in the end I gave up on it. After studying the map later, I found I had not travelled far enough north and this time we found the turn off and with the camper in tow drove down the access track. Luckily it was dry and sunny and not too rough a track. We pulled up at the gate, unloaded the radio gear and set up. It did not look promising as there are huge double sided power transmission pylons marching across the park about 200m away and you could hear the buzzing in the air. On switching on there was static, but not as bad as at home, where I have to endure at least S7 noise most of the time, perhaps S3? I was on air about half an hour earlier than my alert, but after a couple of CQ calls up came VK4RF with 55 each way, next a couple of local chasers with strong signals, 5ZGY/M and 5KLV and then the first of the difficult ones (4RZ) right in the noise but we managed to make the contact. 2IO on a SOTA summit was next and also difficult. I was hearing his “oscar” as S and thinking 3IS, but after persevering we got a little better propagation to make the contact. A few contacts later another station who was 2×2 to me, insisted on giving the full “VK5PL this is VK?? ?” and trying to tell me about his location, radio etc when I was trying to get him to just give his call and also using his own version of the phonetic alphabet. I did finally get his call but never got his report and after 10 minutes I think he either faded completely or gave up as id did not hear him again. Operators should realise if they get a very low report, (3 or less) they should concentrate on just giving out their call and report. The pleasantries of radios/antennas/power can wait for a better propagation day. These were some of the things he was trying to tell me when I just asked for a repeat of his call/report!!! I was only hearing a word here and there. A few calls later I decided to relocate the antenna slightly to get it more end on to the powerlines and I think it might have reduced the noise by a half S-point. Most QSOs after that were better and I only struggled with an Fcall 4FROO in Charleville, 2JDL/P in the Blue Mountains and 5FPSV. With 38 QSOs and a lack of further contacts we packed up and headed to our campsite, deciding we would return on Sunday on our way home and get the last few for the magical 44. Sunday came and it was very windy! I decided to not set up in the open near the powerlines and we found our way to Burra Creek Gorge campsite where I packed up the gear in the backpack and walked in to the park and set up in a sheltered valley out of the wind. Mick 3PMG/3GGG was up first then Geoff 3SQ and John 5BJE. Going in light I had no table/chair so the radio and PTT box were on my pack. I moved slightly to flick the PTT and TX another call and the radio went dead. I checked the mike plug as it sometimes gets intermittent, but not that, then while checking all the plugs were in, the radio crackled briefly into action and died again. I checked the power cord and the solder tag had broken off the power plug. I did try to hold it in contact, hit the PTT and called CQ and 4RF came back to my call, but it was too much to hold the wire against the plug and flick the PTT without losing contact. Maybe if everything was on a solid table and steady, but on top of a backpack, too hard! With only 2 more QSOs to go for 44 it was a bitter pill to swallow, so I packed up and trudged back to the car. Better luck next time and with a spare power cord and maybe some crocodile clip jumpers just in case. Overall this would be my best activation by the number of contacts made. 42 in total, almost half of them to VK3 with 20, 11 VK5, 6 VK2, 4 VK4 and 1 VK7. For this 2nd Anniversary weekend, I had decided to activate some parks in the mid north of SA that do not get activated much. My wife Sue decided that we should make a weekend away together with our two dogs Barney & Chloe, so Friday afternoon we set off with the Little Guy camper in tow up to Burra. A couple of hours later we arrived & visited my sister for a while who was staying there before driving to the caravan park & setting up. The next morning we set off about 7:30 leaving the camper behind in the safety of the caravan park, to our first Conservation Park near Mt Bryan. 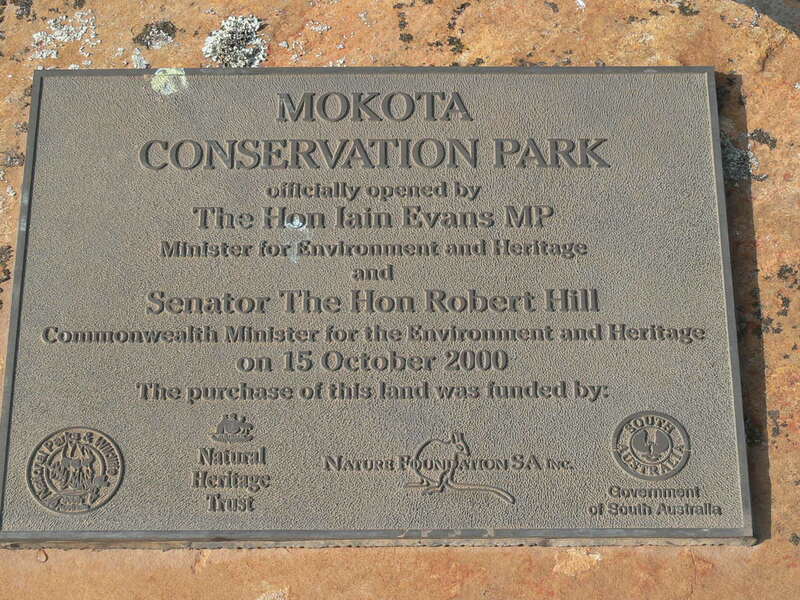 We drove east from the town along some small dirt tracks & found the small gate to Mokota CP. 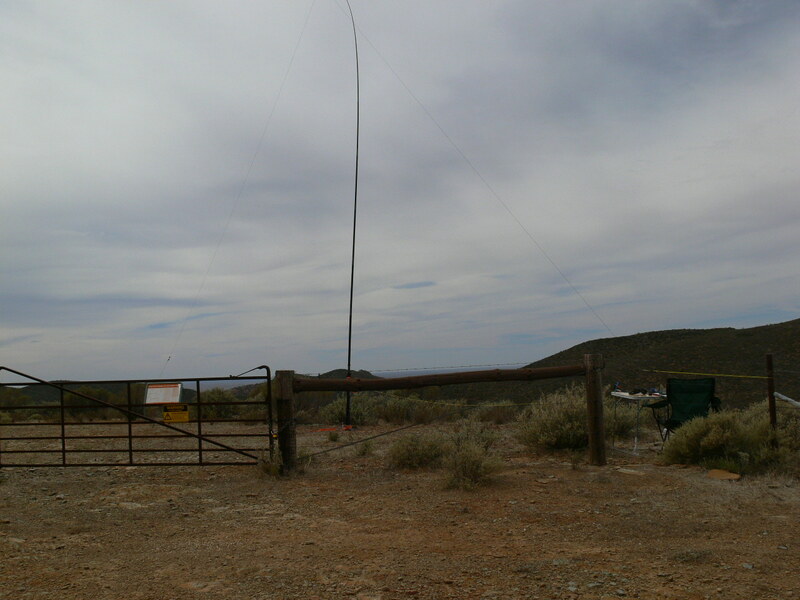 There were a couple of convenient signs to tie the antenna ends to & I was soon set up on the ridge with nice views either side. It was rather windy up there but with hardly a tree in the park it was easy to watch kangaroos hopping across the grasslands & wedge tailed eagles riding the early thermals looking for a feed. The farmer across the road stopped as he passed by for a chat & was amazed I was talking interstate. He said he had trouble getting phone coverage if he was out in the paddocks. After about an hour I had 17 contacts including 6 park to park (1 Victorian park) & It was time to move to the next park, so a quick pack up & we were on our way. We drove past the Base of Mt Bryan, A SOATA summit but I was not tempted to activate as it was a huge climb to the top. Past the old Mt Bryan East schoolhouse now a Heysen Trail rest stop, then turn left on the Mt Dare tourist Drive then shortly after a turn right on the Heysen Trail leading to the Caroona Creek CP. We drove in a little way and at the top of a creek saw this. & was soon on the air & being a little later there were more people around so I was busy making contacts. Sue was in the car reading her book & the two kids lay in their beds watching. I was in the park for nearly 100 minutes for 20 contacts with 6 park to park. 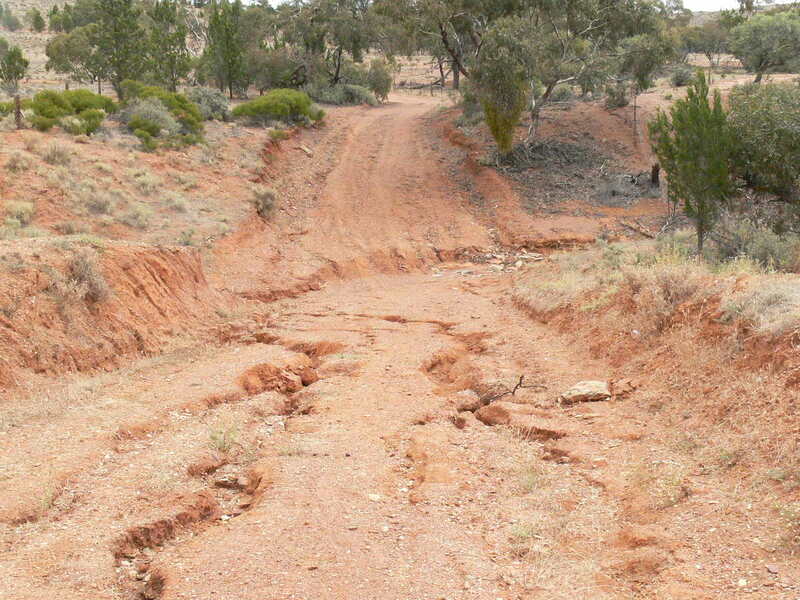 Time to move on & back down the road thru the creek & onto Dust Hole Creek road heading south. There are quite a few creeks crossing this road but being a more major road the crossings are much smoother. There are also half a dozen gates to open & close & on the way you pass the gold mining area at Mongalata. It was 2 hours since the last contact at Caroona Creek & the first one at Redbanks CP. I parked off the side of the road at the North side of the park & again found a handy sign for antenna attachment. We were there less than an hour but made 15 contacts, amazingly all of them park to park from the Lower Glenelg river on the Victorian border through the SE area to Kangaroo Island, Yorke Peninsular, Barossa Valley, Riverland & Caroona Creek (The park we had just been in) & the Murray Mallee near the Victorian border, we just about worked every area that was activated. 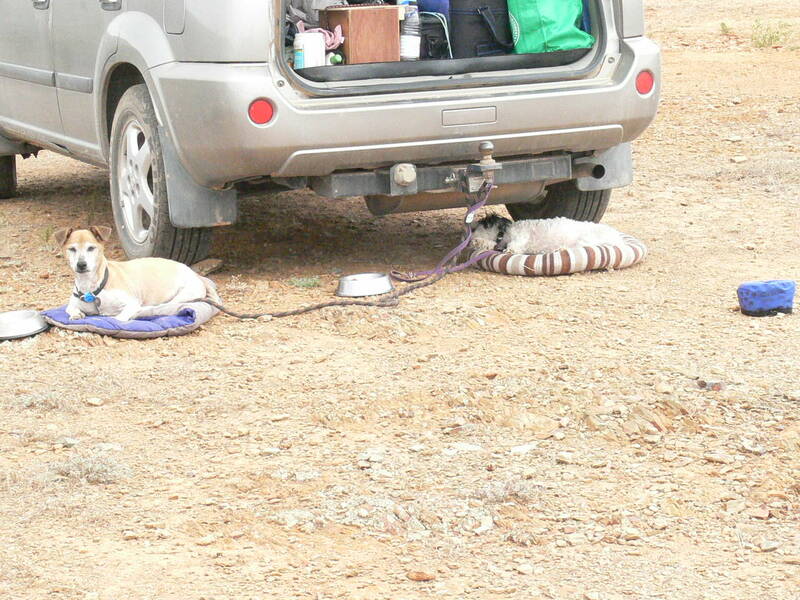 So back to Burra we headed to eat & sleep. The next day, again about 7:30 we hitched up the camper & headed toward the Riverland & our first park for the day, Whites Dam CP. 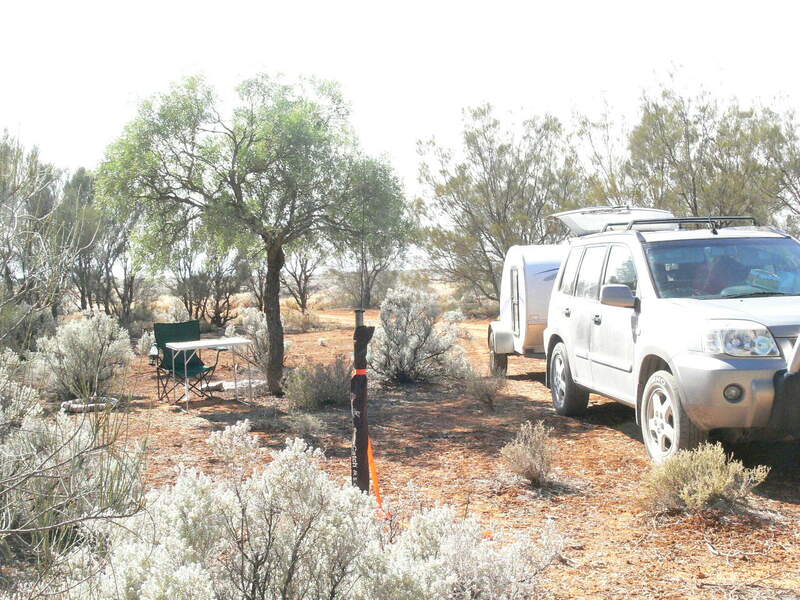 I had studied Google earth & picked a spot in the middle of the park amid a small mallee area. Sue walked the dogs while I set up. I had a quick tune around & listened to the WIA broadcast for a while the went looking for park stations/hunters. At 23:00utc I made first contact with Paul 5PAS in Leven Beach CP, then a steady stream of hunters & a few activators, in a quiet spot I even had time to check in to Hans 5YX after the broadcast, still booming in. At home quite often I can’t hear the broadcast too well by this time. After an hour and a half I had 27 contacts, with 13 park to park & 1 SOTA (Andrew 1NAM in Canberra). Then time to move on again. I filled up with petrol at Blanchetown then headed west along the bitumen to the Brookfield CP. This was one of the parks recently added to the VKFF award so I thought would be eagerly sought after. Because we had the dogs with us we could not drive into the park so I stopped at the parking bay on the south side of the park & hopped the fence to set up, attaching the ends to the fence. I set up with the car/camper between me & the road to try & screen out the noise from passing traffic, it did not really work. I started getting a few contacts & was in the middle of working Peter 3PF, when a small gust of wind added some extra force to the tip of the squid pole which was enough to bend it a little more & the center insulator pinged off & the wire fell to the ground. I hurriedly lowered the pole, reattached the insulator, raised the pole & adjusted the guy ropes so the pole was straight all the way to the top, then got back on & luckily Peter was still there so completed the contact. I had wondered why Paul 5 PAS was not around when we heard from someone that Peter 5FLEX had got bogged & Paul was busy phoning Peter’s mates to try & get him out, which the eventually did. Peter was actually my last contact for the day. He had set up in the park where he was bogged to get help & kept listening & calling while he waited for rescue to come. I had intended to do a couple more parks but the family, including me was all radioed out so after a couple of hours with 25 contacts, 11 of them park to park & another SOTA (Ian 5CZ on the South Hummocks near Pt Wakefield) we packed up & headed down the bitumen & home. All in all a fun weekend with 104 contacts, 50 park to park, 2 SOTA, 43 different parks & of those 22 were new parks I had not worked before. As a PS these activations used my end fed half wave antenna for 40m into my Xiegu X1M Transceiver running 5 watts, day 1 used my LiFePo4 42oomAh battery & day 2 I used a 12v lead acid car battery. I decided to go out to Cromer CP for the Friday the 13th twilight activation due to the fact that it has just been added to the World Wide Flora & Fauna Award. It would give chasers points towards two awards for the one contact. I stopped at the same spot I had activated at previously as there is as nice flat area outside the fence to park the car off the road & some shade amongst the trees. I decided to try out my latest antenna for 40m, an end fed half wave. I bought the SOTA beams matching unit to match the high impedance of the end fed to the radio’s 50 ohms. I was soon set up & the lighter weight of the centre of the end fed meant much less strain at the top of the squid pole. I was soon ready to go & tuned around looking for other activators & after tweaking the matching unit, my ear drums were soon getting blasted by strong signals everywhere. I had the volume turned almost to nothing & very strong sounds in the headphones. Not sure if it was the antenna or just very good conditions. First contact was Arno 5ZAR in Ferguson CP, then worked John 5BJE in Scott Creek, Geoff 5HEL in Ettrick, Paul 5PAS in Charleston, Peter 5FLEX in Pike River, & Adrian 5FANA in Birds Island. I found a clear frequency and regular chaser Amanda 3FQSO called in & spotted me Then came a rapid parade from VK5, VK3 & one from VK2 Doug 2FMIA in Horton Falls National Park. I also worked Peter 5PET in Ferries Mcdonald CP & Les 5KLV in Mt Remarkable NP and Gordon 5GY in Kenneth Stirling CP. I had a tune around on 20m for about half an hour & there were plenty of english stations working VKs, but my 5 watts was not enough to be heard by them. I went back to 40m & got Rob VK4FFAB just as the sun was hitting the horizon, so then decided to pack up while it was still light. It was a lovely evening with 22 QSOs, 10 of them Park to Park. The kangaroos started to come out of the park to feed in the paddocks on the other side of the road as the sun sunk close to the horizon and birds were flitting through the trees. At one stage, a flock of black cockatoos flew overhead, I don’t think I have ever seen them in the Adelaide hills before. I have seen them over on Eyre peninsular before. I was very pleased with the EFHW antenna, maybe it’s the short piece of coax that makes it better instead of 9m from the top of the squid pole to the radio with the dipole. Most signals boomed in. For the second Friday twilight Activation I chose Sandy Creek CP as it was fairly close to home & has a small carpark with easy access over a low permapine log fence to an activation spot. I was a little late getting there as I almost forgot about the activation, but I had everything packed this time & was soon set up in the late afternoon sunshine & a very slight breeze & ready to go only 20mins behind schedule. I was trying out a new squidpole support that I had found a few years ago & thought it would be handy for something, like a bike support (i was into bikes then). It is a 10mm rod about a metre long welded to two 30mm flat bars that form a cross for the base. I had drilled holes near the four ends of the cross to be able to peg it down. It worked fine in the slight breeze that evening but it was difficult to strap the pole solidly to the thin rod. I will have to think of a mod to secure it more firmly. It is good when there is no convenient pole/post/tree to fix the squidpole to & if you are close to the car. It is a bit bulky to have to carry far. 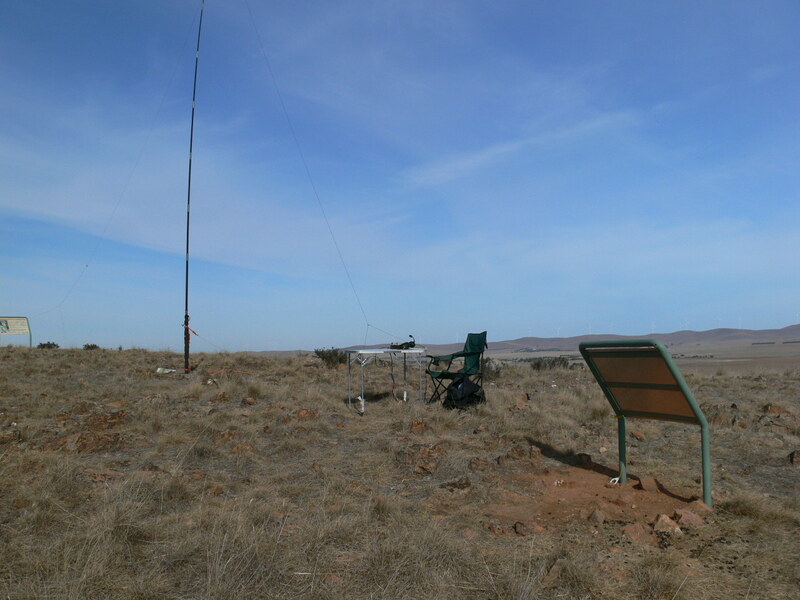 The activation started with 2 park to park contacts, Greg 5ZGY in Black Hill CP & Paul 5PAS in Monarto. I tuned around a little looking for others & heard John 5BJE very faintly talking to someone also very faint but both unworkable due to QSB. I then found a clear frequency & started working others, then 5BJE found me & his signals had improved & I had another park to park. The Victorian stations started coming in loud & strong & was called by Bernard 3AV in Kinglake NP. Tuning around again I contacted Tom 5EE in Naracoorte Caves NP and Larry 5LY in Cooltong CP with Peter 5FLEX on his first SANPCPA experience. A few more chasers called me then Bob 5FO in Morialta & a final call from David 5LSB who is another newcomer to Park chasing. I lowered the pole, pulled the links to set the antenna for 20m & re-hoisted. I called a few times & tuned around but heard no activators or chasers but did hear a lot of euro stations coming in loud & clear, Spain, Italy & Belgium & also some JAs, some were even chasing VK & making contacts. I tried a few calls, but they obviously did not hear me, so time to pack & go home. As I was lowering the pole a police car pulled into the carpark & I immediately felt guilty, but it was the local copper. He asked what I was doing & told him I was playing with my amateur radio. He asked if I had seen anyone walking about & said I had seen no one & I then said he’s not a murderer is he? He just laughed & said it was just someone acting suspiciously. I quickly packed while he drove into the park to have a look around. (it would be nice to have his bunch of keys) & left quickly, heading for home. I then tuned around the band hearing just static. Putting out a call or 2 before realising I hadn’t plugged the coax back to the radio after the analysing. Oops! fingers crossed no damage, plug in & big signals. Worked Greg 5ZGY in Telford Scrub, then QSY to my own frequency & worked 2 or 3 more when, Crash!! the squid pole slides halfway down in the middle of a QSO. The antenna wire had snagged on a piece of bark on a tree so the pole hadn’t fallen all the way down. Signals still 59, finish the QSO & straight away, another caller, work him then re-erect the squid pole & work a few more. It was very pleasant with the afternoon sunshine & a little shade, but the traffic noise from Mt Crawford Road only about 40metres away was very loud, especially when a truck went by drowning out the radio. After about an hour the LiFe battery running the IC718 at about 15 watts had had it, so I grabbed the big power pack & found a couple of my charger leads with crocodile clips & connected onto the clips on the battery booster & worked 1 more station. An eventful twilight activation! I worked 19 stations, 13 VK5 & 6 VK3 with 5 park to park contacts. I thought I may have killed the LiFe battery as it wouldn’t get into a charge cycle when I put the charger on before driving home. Looking at it that night, I realised I had the balance plug in the wrong connector, Doh!! A very pleasant summer evening for a short activation. I had wanted to activate a couple of summits in the mid north but a week with a virus did not make for a very fit SOTA summiteer so I decided to give Mt Lofty another try. It is only a hundred meter walk or so into the activation zone, I could handle that. An hours drive from home saw me pull into the carpark at Mt Lofty and I grabbed the pack & antenna & setoff into the activation zone & started setting up. When the antenna promptly collapsed back down I could see it would be one of “those” days. I relocated to the next tree & put the squid pole up again a little more in the clear this time with no pressure at the top of the pole which I think caused the collapse. I sent a couple of calls but no readable reply was heard & i was getting worried that something was wrong, so rechecked all connections & plugs were fully in & even lowered the pole to check the antennas connections. The conditions were bad but finally was able to hear some callsigns. I was disapointed with the conditions. It was not noise that was the problem, just lack of signal strength. I was expecting to get some summit to summit contacts with a few of the other states. This was my worst ever portable activation, I am usually able to hear most stations at least 5×5 but today I had trouble even hearing the callsigns. Managed to work 13 stations before I started feeling bad again from the virus & knew I shouldn’t push my luck further so cancelled any thoughts of a conservation park or 2 on the way home so packed up. Paul VK5PAS organised the Weekend to celebrate the 1st Anniversary of the VK5 Parks Award. Quite a few Amateurs had indicated they would activate parks. On the Saturday I set off about 7:30 am for the closest park to me, Hale CP. I loaded up the pack & with the squid pole over my shoulder set off up the track. I wanted to get a bit of height & after 15mins was close to the top of the hill, so got off the track & moved uphill to a small clearing unpacked & set up. When I started operating I realised I had somehow locked the buttons on the X1M radio & tried pressing everything in sight including the LK/SYS button ( for some reason I only read the SYS part) nothing would unlock. I had visions of packing up, going home to find the manual. Luckily I was on a clear frequency so put out a call & started making contacts. Amanda VK3FQSO tried to help but only had the early model instructions. I think it was Larry VK5LY who also had the same radio who told me which button to hold in & then I saw the LK inscription. I stayed in Hale for about an hour & a half for 21 contacts, then packed up & moved up the road to Warren CP. I had wanted to get into the northen part of Warren as it has a higher elevation than the entrance on Watts Gully Road, but it meant abit of a hike through Mt Crawford Forest up to the fire lookout tower & then along the Heysen Trail into the Conservation Park. The first part along the fire track gets quite steep in places & I had to rest in the shade a couple of times. Once up at the fire tower there is a great view in most directions & the Heysen trail is well signposted. It is very difficult to tell exactly where the CP begins but I knew there was a marker board at a track junction that was definitely in the park. I walked along the narrow trail through regrowth after a fire a few years ago, then suddenly came upon the marker board & some nice bench seats & a post to attach the squid pole to. I was soon set up & making contacts the first with Stu, 5STU in Black Hill CP, quickly followed by Paul 5PAS in Deep Creek CP. I had 2 sets of walkers pass by, they frightened me with theit feet stomping & I think I frightened them as they suddenly heard this strange talking in the bush ahead of them. Just over an hour later I had worked 23 stations from this location & it was time to pack up & go home & take the XYL out for her birthday dinner. The walk up had taken about 90 minutes, going back down was about 65 mostly due to the smaller climb up to the fire tower & the rest downhill. I had to get up a bit earlier today as daylight saving had ended this morning, & drove out to Cromer CP. Todays parks were to be a quick, over the fence to a nice little clearing & setup. No long distance trekking today. I was soon on the air & Chris VK4FR/5 was first in todays log, then Amanda again 3FQSO then Peter 5KX & Paul 5VCO in Clinton CP, Andy 5ARG in Morialta, Paul 5PAS in Deep Creek & Andrew 5KET from Telford Scrub. Lot’s of different parks for both chasers & activators. After about an hour & 16 stations worked, I decided to pack up & move to the next park. I pulled up at the gate, picked up my pack & walked in about 100m to a clearing beside the track. I started setting up the pole & running out the antenna wire when I felt something bite my finger ooowwwww!!!!! It was a big bullant & boy did it sting. It looked like they had a nest close to the stump I had the pole attached to. There was hardly any activity from the nest so I decide to stay but moved to the other side of the stump & carefully watched for any attacks. One did suddenly appear over the edge of my little table but he was soon flicked some distance away. I was soon tuning across the bands & found Larry 5LY again this time in Ridley CP, then Tom 5FTRG in Furner CP, Amanda 3FQSO who worked me in every park I went too. I worked a total of 20 stations in just over an hour here, my final contact being Peter 3PF on Mt Matlock, a SOTA summit. I was getting a bit confused with the local time as my watch was still on Daylight saving & I thought it was later than it was, so moved to my last park for the weekend. This CP has had a fire so there are lots of dirty black stumps & trees around but also the ground vegertation has grown up quite thickly in places so it is a bit hard to get through. There is a Pistol Club on the West edge of the park so I moved moved into the forest to the west a bit to try & get away from the noisy gunshots, they were loud all the time I was there but the headphones cut it down a bit. An hour after my last contact at Charleston I was making contact with Greg 5ZGY in Narracoorte Caves NP & then Paul 5PAS who was now in Eric Bonython CP. I picked up another SOTA Peter 3ZPF & lots of the other activators & chasers like John 2AWJ, Col 5HCF in Big Heath CP, Arno 5ZAR, Andy 5ARG from one of the thousand parks he activated with Mark over the weekend, John 5BJE, Larry 5LY, Amanda 3FQSO, Don 5NFB & Peter 3PF on another SOTA summit. In total I worked 27 stations in the 2 hours I stayed in this park. Thanks to all the activators & chasers who participated & to Paul 5PAS for getting us all enthusiastic to get out & about in the SA parks. This was one of my best Amateur Radio experiences, perhaps after my first ever contact & my first ever DX contact.